If you can’t buy it, rent it ! Today’s fashion is often tomorrows horror. It’s for this reason, I have never been a keen collector of clothes. Sale is my best friend when it comes to premium brands, and off late, it’s the rental fashion that has caught my fancy. Holiday and the festive season is probably the most stressful part of the year. Everyone gets invited to weddings and parties, and more often than not, one doesn’t want to repeat the same clothes. Social media is to blame for this, what with the quest to add outfit pictures on Instagram and Facebook becoming an urban woman’s daily struggle. Flyrobe is one website that solves all of these problems. It’s one of the best places to rent out outfits for a date, to your best friends wedding, or even to your own party. They have an amazing collection that is perfect for an array of occasions. This week I was generously invited by the Flyrobe team to check out their wedding collection. I picked few of my favourites, based on budget and overall look feel. Here’s a bit from that shoot. Ok, I will just say it out loud. I felt like a queen when I put this on. 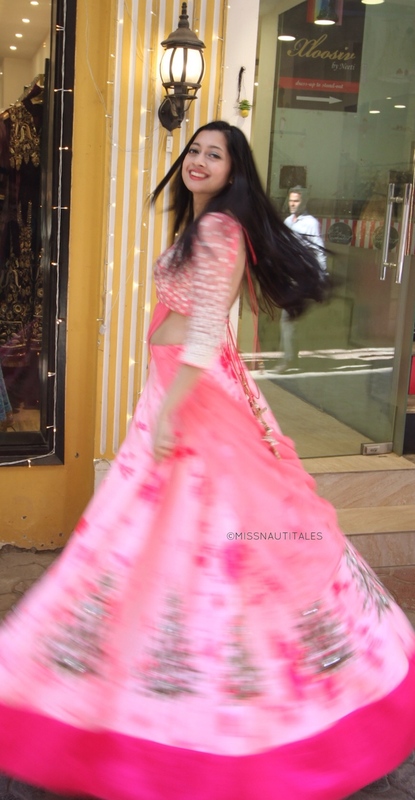 Tie Dye lehengas are trending this season, and one can never go wrong with pink. The reason I picked this outfit was not just about the colour, but also the style of the outfit. The dupatta was stitched to the blouse making it super comfortable fuss free to wear. I would highly recommend this outfit for any prewedding function or a morning event. It looks great in sunlight and one can re-wear it on multiple occasions. Flyrobe big Fat Wedding Show is taking place in Delhi & Mumbai from 20th to 24th December. If you are on a lookout for ethnic wear on a budget, I would highly recommend you to visit their Rajouri Garden store.